Gary Tucker was drawing and painting from an early age, even in high school he began to think more seriously about life as an artist, and with the support of family and a chance meeting a life long mentor and artist, Mrs Anita Fahs, he started to make art his life path. Eventually Gary was drawn east to Boston where he enrolled at The School of the Museum of Fine Arts. Here Gary studied with Professor Kaji Aso, who taught watercolor and Japanese Calligraphy. Professor Aso introduced eastern aesthetics, Calligraphy and Sumi painting. Gary was also introduced to the media of watercolor and found he could achieve more subtlety and expressiveness in his painting. 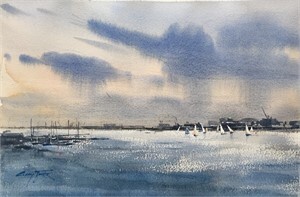 Gary is also a popular teacher and teaches classes and workshops in watercolor in Boston and the north shore. Gary also leads painting excursions to Japan, Greece, Italy and most recently Santa Fe NM. Gary is a artist member of the Copley Society, the North Shore Arts Association, and the Rockport Art Association. He is at home painting in the studio or in plain air and his recent works portray a unique view of Boston. 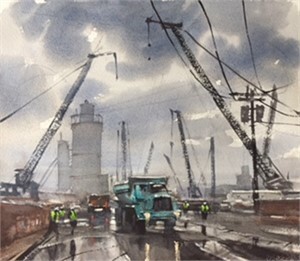 His watercolors have won numerous awards, most recently he was given the Marilyn Sabin Memorial award at the 15th North American Biennial show held by the New England watercolor society. View more of Gary Tucker's Paintings on our marketplace. Regatta, Busy Corner and Vermont Pastoral. Gary Tucker Gary Tucker was drawing and painting from an early age, even in high school he began to think more seriously about life as an artist, and with the support of family and a chance meeting a life long mentor and artist, Mrs Anita Fahs, he started to make art his life path. Eventually Gary was drawn east to Boston where he enrolled at The School of the Museum of Fine Arts. Here Gary studied with Professor Kaji Aso, who taught watercolor and Japanese Calligraphy. Professor Aso introduced eastern aesthetics, Calligraphy and Sumi painting. 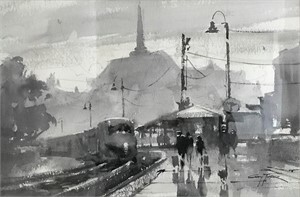 Gary was also introduced to the media of watercolor and found he could achieve more subtlety and expressiveness in his painting. 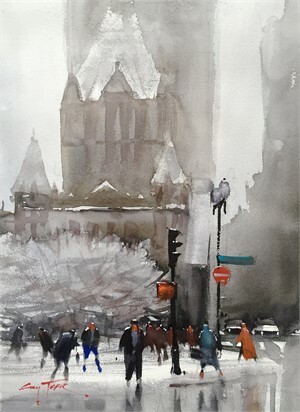 Gary is also a popular teacher and teaches classes and workshops in watercolor in Boston and the north shore. Gary also leads painting excursions to Japan, Greece, Italy and most recently Santa Fe NM. Gary is a artist member of the Copley Society, the North Shore Arts Association, and the Rockport Art Association. He is at home painting in the studio or in plain air and his recent works portray a unique view of Boston. 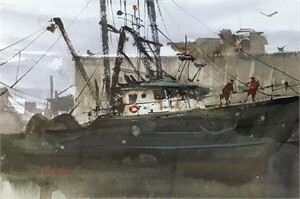 His watercolors have won numerous awards, most recently he was given the Marilyn Sabin Memorial award at the 15th North American Biennial show held by the New England watercolor society. “I feel commonality with the Turner, the Impressionists, and the Chinese and Japanese Zen painters in that I am captivated by nature and through my artwork attempt to capture a sense of the moment in nature and, just as important, the spirit or energy of nature. Through the media of watercolor and my process of painting I ﬁnd power through brushwork, and subtlety through transparency” “Watercolor differs from other media in that there is a performance aspect to it. The ﬁne pieces come out in one sitting and very often like a classic performance, something happens, a fusion of mind and subject, an improvisation that cannot be duplicated” —Gary Tucker View more of Gary Tucker's Paintings on our marketplace. Regatta, Busy Corner and Vermont Pastoral.